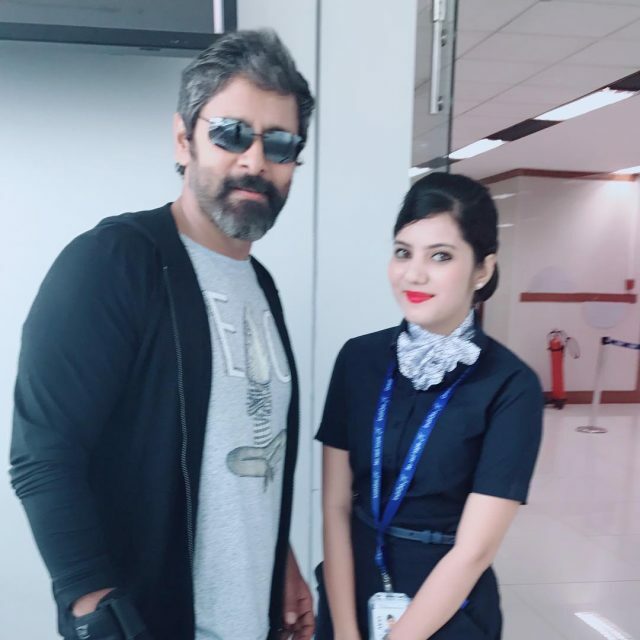 This photo of Vikram with a fan is awesome. The dashing Vikram is arguably one of the most successful and sought after stars in Tamil cinema today. During his highly illustrious career, he has won the love of movie buffs thanks to his gripping performances, good looks and elegant personality. Moreover, he has impressed all and sundry because of his humility and helpful nature. Now, his fans have a big reason to rejoice.In an awesome development, a photo of the much-loved superstar is going viral on the social media and that too for all the right reasons. In it, Vikram can be seen alongside a fan. And, as expected, he looks quite dashing. His relaxed body language gels quite well with his cool avatar and ups its recall value in a big way. We are sure that the fan must have enjoyed meeting Vikram to the fullest. On a related note, this is a busy time for Vikram. He currently has ‘Sketch and ‘Dhruva Natchathiram’ in his kitty. ‘Sketch’ is touted to be an action-drama and also features Tamannaah in the lead. On the other hand, the Gautham Menon-directed ‘Dhruva Natchathiram’ is a spy-thriller and also features Aishwarya Rajesh in the lead. Interestingly, a couple of days ago, it was reported that he may soon work with ‘KO’ director KV Anand. However, nothing has been confirmed. It goes without saying that given Vikram’s popularity, these films have already created a buzz amongst fans. So, did you like Vikram’s stylish avatar in this photo? Talk to us in the space below. I am also think so.